The woman who apparently thought that U.S. Customs agents at the Mexican border would never check the contents of a diaper, thought wrong. 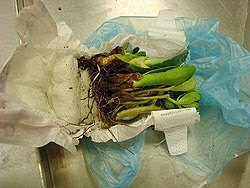 After the woman declared that she had no plants with her, the agents searched her vehicle and, underneath the seat, found a diaper containing 10 agave plants. For those concerned about invasive plants coming into the country and causing problems, it’s nice to know the customs agents have that kind of vigilance.